My first job out of college was working for a small start-up as a buyer working on purchasing jewelry and accessories from Korean designers for an eCommerce brand. At this time, I was introduced to Korean culture. From K-Pop music to Jimjilbang sessions to eating Bimbimbap, I always admired my boss’s ritualistic skincare routine and she actually encouraged me to always wear moisturizer and sunscreen on my face. We’d spend a day in Los Angeles exploring Koreatown and do sheet masks at night while staying at The Line Hotel. I became acclimated to Korean culture at this time, but the skincare routine wasn’t something I actually did. Now, after working and hanging out with my friend, Brian, who absolutely loves skincare, my attention to how I take care of my face expanded. A few months ago, Brian spent the night at my house and I was re-introduced to the sheet mask. He gave me one that moisturized my skin and I found a huge difference the next morning. After a conversation about skincare with him and how important Korean beauty was, I found myself at Sephora the next day purchasing an AmorePacific Oil Cleanser. He convinced me that the one I previously used wasn’t exactly great for my skin. Thanks to Brian, I now have an expanded skincare routine and a re-kindled love for Korean skincare and beauty products. Follow my everyday step by step skincare routine below. I do this every morning and night to ensure I prep my skin for whatever it has to go through during the day. 1. AmorePacific Treatment Cleansing Oil: This washes away dirt, dissolves makeup and is best when put on dry. The clean and pure smell is an added plus. 2. Laneige Brightening Sparkling Water Foam Cleanser: Always double cleanse. This washes away all water-based impurities to ensure that you didn’t miss it the first time around. 3. Son & Park Beauty Water: Using a small round cotton pad, this hydrates your skin and doubles as a toner and gentle exfoliant. 4. May Coop Raw Sauce: Essence is always great for prepping your skin for your serum, moisturizer and eye cream. It helps absorb all three of these very important products. 5. Laneige Water Bank Serum: This is another great hydration boost for your skin. It softens and refines the skin’s overall texture and hydrates it for 24 hours. 6. Banila Co. IT Radiant Eye Cream: Brightens and protects the very sensitive skin underneath your eyes. Also preps your under skin for any type of concealer you may be using. 7. AmorePacific Moisture Bound Hydration Intensifying Creme: This leaves skin feeling fresh and smooth throughout the day. Hydration is always important for the skin and this locks all moisture from the steps you’ve done before. 8. Tarte Tarteguard SPF 30 Sunscreen: This is the most important part of skincare. Protecting your face from the sun will leave you with less wrinkles later on in life and re-invigorates your skin continuously. With this product, you’ll find your skin looking younger, brighter and smoother. 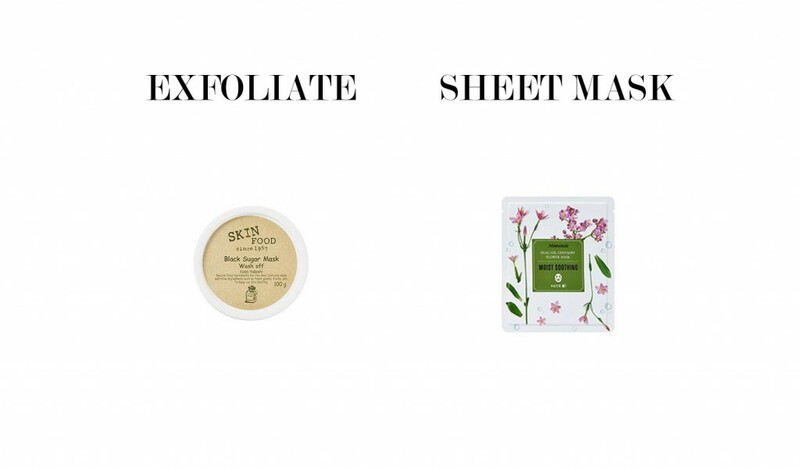 Sheet Mask: I do this about 2-3 times a week, depending on how much time I have. It takes about 15-20 minutes depending on what mask you have and all you have to do is leave all of the excess residue as a moisturizer. I’ve been doing this routine for about 4 months now and I’ve found a huge difference in my skin. Throughout the day, to keep my skin hydrated, because we all know San Francisco has temperamental weather, I add spray on the AmorePacific Moisture Bound Skin Hydration System. It’s a great mist to keep in your purse. I am also obsessed with the smell. 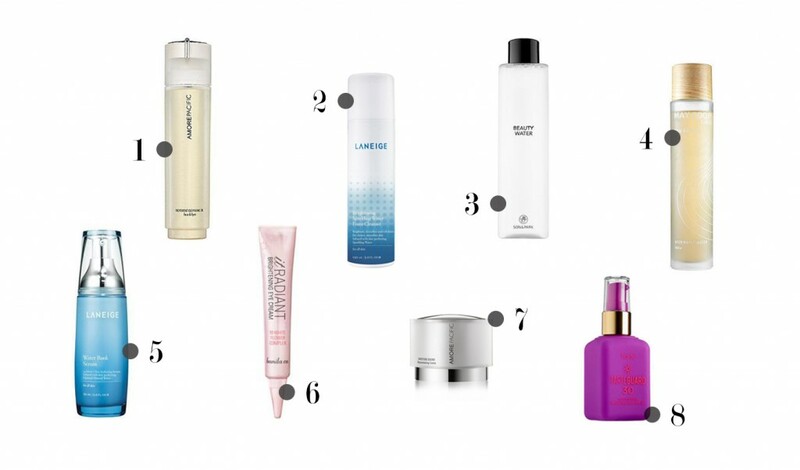 What are your favorite Korean skincare products? Do you have any recommendations?